flight. The second is some simple exercises demonstrated in a free brochure. Wobenzym: Systemic enzymes like the ones in Wobenzym, are necessary for the regeneration of cells and the health and functionality of all organs and tissues. As people age, enzymes are lost and should be replaced. 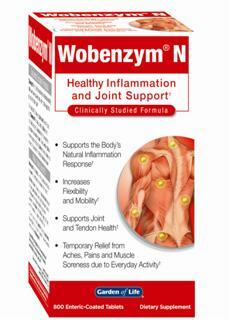 More than 150 clinical studies have shown Wobenzym helps to keep the body running smoothly by enhancing circulation and breaking down harmful proteins that can lead to stiffness, swelling and joint discomfort. It's this circulation enhancement that may lessen the risk of DVT for long haul airline passengers. during flight, passengers stretch or flex the calf muscles while seated, drink plenty of water and avoid alcohol and caffeine that can cause dehydration. Naturally Vitamins is taking the lead in passenger education by publishing a free brochure demonstrating simple exercises. The brochure features Dr. William Wong, a naturopath, a PhD exercise physiologist, and a certified sports medicine trainer.